CLICK HERE to link to the original article in the News-Sentinel. While many are grilling out and lighting fireworks to celebrate America’s independence, the Voices of Unity youth choir will be performing at the epicenter of the Catholic Church.The venerable group will be the sole provider of music for the Mass at St. Peter’s Basilica at the Vatican on July 3. The opportunity is the highlight of a four-country “Journey to the Vatican” tour this summer.”This is one of the most incredible honors to date for us,” said Marshall White, founder and CEO of the Unity Performing Arts Foundation and the Voices of Unity choir director. “We have been asked to perform in one of the most historical places on Earth…bigger than life!”While it is too early to know if Pope Francis will preside over the Mass that day, the excitement over being the lone performer in one of the holiest sites in the world is high. Voices of Unity was originally asked to be one of several musical groups to help lead a Mass in early July. That initial plan was changed to the Fort Wayne group becoming the lone musical accompaniment for the Mass.”The opportunity itself is huge and we are extremely happy to have been offered this experience,” White said.The choir is expected to showcase five pieces during the Mass at the Vatican in its soulful style that has won numerous awards around the country and worldwide. 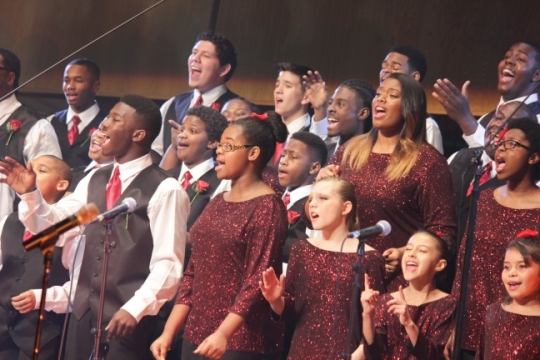 Several gospel-style spirituals will be performed in English, with the piece “Total Praise” set to be sung in Italian during the concluding rites.The Unity Performing Arts Foundation is looking to raise $1 million for the trip and other yearly expenses – including programming, operation and ongoing growth and sustainability – through its Journey to the Vatican fundraiser. A total of 87 youth and support staff are set to go on the trip.”We are about halfway there with cash in hand and pledged donations,” said White about the fundraising progress.The Vatican is just one stop in a series of visits from June 29 to July 13. Voices of Unity will also be performing in Venice, Italy; Vienna, Austria; and Budapest, Hungary.The group will also conduct workshops to teach their unique style of soul. Voices of Unity will sing with the International Honors Choir in Budapest, performing pieces ranging from gospel to classical.During the Vatican portion of the trek, Voices of Unity will also compete in the Roma International Choir Festival and Competition.The choir is currently hard at work learning songs in Latin, Hungarian and Czech to perform.The News-Sentinel will have complete coverage before, during and after this historic opportunity for Voices of Unity, including profiles of current and former members, the impact of the choir at home and abroad and the memorable experiences of traveling to some of the most cultural significant sites in the world.